Queen’s 2017 BSc Architecture graduate, Luca Garoli, was awarded a High Commendation in the RIBA President’s Medals – the Institute’s oldest awards – at a ceremony at the Royal Institute of British Architects in central London in December. While the RIBA President’s Medals have been presented since 1836, this is the first time in living memory that a graduate from a School of Architecture at Queen’s has done so well in what are considered to be the most prestigious international awards in architectural education. Entries for 2017, which are exclusively by invitation only, were received from 373 schools of architecture in 71 countries. 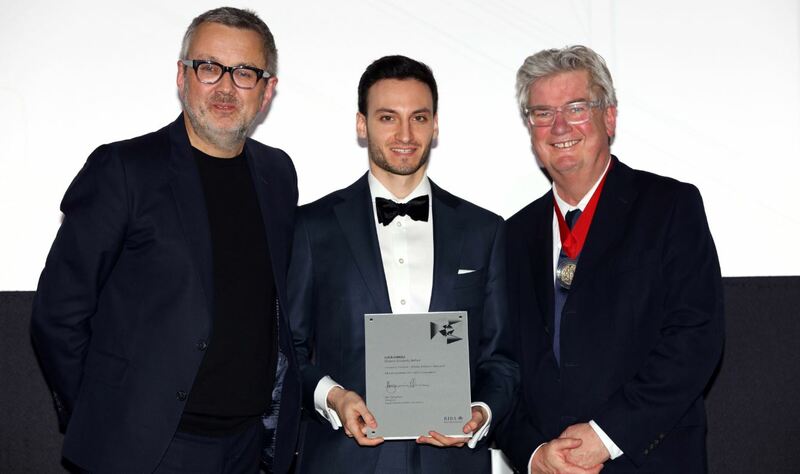 The RIBA Bronze Medal judging panel awarded the High Commendation to Luca Garoli for his design work entitled ‘Innovate to Conserve: Whiskey Distillery in Ballycastle’ the focus of the final semester design studio for year three. Luca’s full RIBA submission can be viewed here. A different judging panel from the UK office of Skidmore, Owings & Merrill (SOM) also chose Luca’s work for a commendation in the SOM UK Foundation Fellowship. “The passion and intelligence with which these graduates address complex architectural briefs by drawing from personal experiences and involving those for whom their buildings are designed is achieved with remarkable rigour and commitment. Luca graduated in July 2017 with a First Class Honours in BSc Architecture (RIBA & ARB Part 1) and is in his year out placement with Weston Williamson Architects, London. Caption: Alan Jones from Queen’s, Luca Garoli and Ben Derbyshire, incoming President of the Royal Institute of British Architects.